In Sundar C’s Vantha Rajavathaan Varuven (I will come like a king), Nasser plays the founder-chairman of a company worth gazillions of rupees. He’s based in Europe. He eats breakfast like a European, with a fork and knife. But his heart is all Indian. It yearns for the daughter (Nandini, played by Ramya Krishnan) he banished from his house, when she married a lawyer (Prabhu) who wasn’t worth gazillions of rupees. Now, he deputes his grandson, Aadhi (Silambarasan aka Simbu aka STR), to repair this rift. But before we see Aadhi, we hear of him. When someone expresses doubt over Aadhi’s abilities, his grandfather says, “You’ve seen him silent, now see him violent.” This sounds like an interval-block punch line, which hints that the so-far-silent hero is now going to turn violent. But here, it’s just rhyming wordplay. Like duty/looty. Like sagalai/ragalai. You keep praying no one, in the context of a folk performance, utters the word “koothu”. And yet another cash-grab from Sundar C. after the letdown that was Kalakalappu 2. Yet to read the full review. 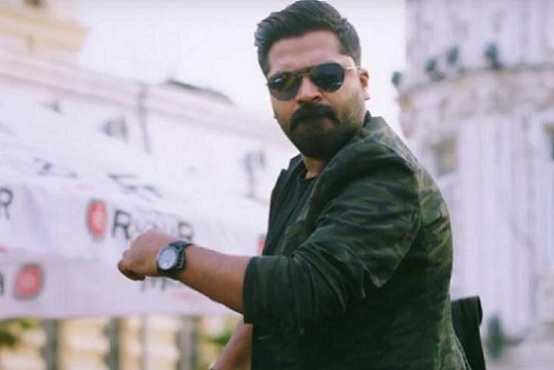 Does Simbu want to become the next MGR, after trying to be the next Superstar? Yenna nambi kettavanga… is just a reworking of the famous MGR dialogue in Nadodi Mannan. Remix of Madurai Veeran song. I agree with you, few movies lose that essence of it when they are remade in other languages. Lot Director Trivikram movies in Telugu are big hits but when they were remade in Tamil, they are not successful. I think it is because of the language flavor in comedy punch lines. @meera: I could think of “Thalai keezhaga thaan gudhippen”. Doesn’t the title translation mean “If I come, I will come like a King” ? On the other hand.. review paducha BR odadhu dhan padipen !! What tortures one has to endure because of being a critic…And your explanation for the title was hilarious…!! vandha rajava thaan varuven is Simbu’s line from chekka chivantha vaanam. Even the title is not original. In an ideal world C.Sundar would have been retired long back. I feel he is a good star actor who’s compulsively watchable. He doesn’t have a big range, but I’ll take him over many actors in Tamil. BR: What about manmadhan? One of the most trashiest of films with a stupid story and yet I unable to switch off the TV when it’s on. Same here. And I’ll add Vallavan to the list. Between the 2 films, Simbu pretty much sets the Women’s Movement back by at least half a century, but he himself is compulsively watchable. KayKay: Too bad he’s not using that gift often. There isn’t much to remember in his career looking back except maybe VTV, which was more due to the name on the director’s chair than the film itself. I love his presence in films like Silambattam, other, pods podi, etc. Heck, I rate him higher than Vijay or Ajith, who for all their star wattage won’t be able to make something like vaalu watchable. He is also an terrific dancer, that yammadi yaathaadi with jyothika will be grooved in discos for ages. Correction: Silambattam, Osthee, poda podi. I can totally identify with Bee and KayKay. Haven’t liked a single STR film to date despite being his biggest fan since the age of 4. And no, I didn’t like Vinnaithadhi Varuvaya (Wasn’t Simbu simply superb in that flick though?) Silambattam was a lot more fun but even that is not exactly a masterclass on masala filmmaking. Yet, there is something about that Silambarasan. As a performer, he is simply electrifying and I genuinely think no one has come remotely close to tapping his potential. Really wish be would work with some of the talented youngsters rocking the industry. Wouldn’t it be awesome if he did a film like Pariyerum Perumal? I was jumping with joy when it was announced that he would work with Selvaraghavan. Pity that didn’t pan out. Hope Venkat Prabhu makes something along the lines of Saroja or Mankatha with Simbu. I live on in hope… It’s all I have after the godawfulness of VRV. For all those who responded – you are the reason why tamil cinema thrives; we get taramani, and we get Silambattam. Anuja ma’am, you totally nailed it when you mentioned STR in a movie like Pariyerum perumal. That will be the day! There is something so raw and heartfelt in his performances, it doesn’t matter how ridiculous the movie is or the premise of his character is. I like Simbu as an actor too. But his off-screen shenanigans are too much for me to become his fan ! Not surprised to see a lot of women liking Simbu as an actor despite his not-so-memorable movies. IMO, among the current generation of actors, Simbu is quite handsome. And in movies like Manmadhan, Vallavan etc., he demonstrates a certain vulnerability, which is rare and is very endearing to women. This makes one feel that his reported ‘misbehavior’ is only a result of him being heartbroken, due to a few bad women. And all that is required, is for him to meet the ‘right woman’, who will ensure that his heart is not broken again and hence will earn his eternal love and loyalty. As I said earlier, I am not at all surprised to see that women like him a lot. Simbu is a good actor, but at least for me, not good enough to look past the awfulness of his movies. Simbu is Nick Kyrgios of Kollywood, but speaking personally, I have always been irritated by him. My favorite Simbu performance from a movie that I didn’t like so much is one specific stretch from Vaanam where he steals money from an old couple. He’s just phenomenal – switching between restraint and the OTT zone with ease. Simbu also made CCV more watchable for me along with VJS. I was constantly grinning watching them play off on each other’s nonchalance. I’m just grinning at the thoughts of BR having to read all these comments about simbu and his acting talent, while in the middle of his Berlin excursion watching highly sophisticated auteur flicks that people can write books on.